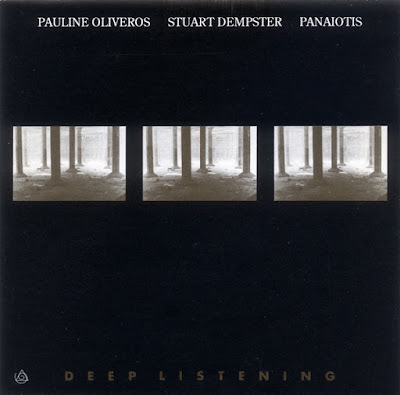 This is the release that Pauline refers to below where the 45 second reverberation time of the Dan Harpole Cistern shapes the music and becomes the fourth member of the band. A truly seminal recording. CD released on New Albion in 1989. The segue from musical concrete, to Elaine Radigue, to Pauline Oliveros is much appreciated. And very smoothly done. Thanks! Having got through the Kawabata re-posts thought I should report back that they are all that I had hoped they would be! Thanks again for that too. In fact, thank you, thank you, thank you! If that isn't too obsequious. Essential listening for all human beings. You're in luck ... five thank you's makes you obsequious. However, we might have let you off for the fine use of segue.